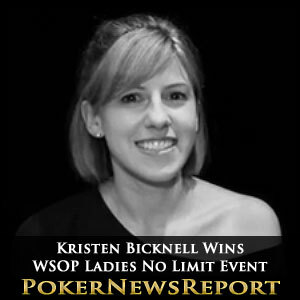 The WSOP Ladies No Limit Hold’em Championship has been won by Kristen Bicknell, who beat a field of 954 players to win a WSOP Gold Bracelet and $173,922. 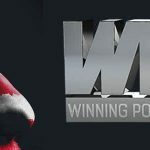 It was also the tenth Gold Bracelet to be won by a Canadian player at this year’s WSOP, meaning that Canada has won just under a fifth of total tournaments at the event so far. Cindy Kerslake was the first lady to be eliminated from the final table, finishing up in ninth spot to win $12,389. She was followed by Chris Priday, who was knocked out of the event in eighth place and took home $15,858 for her efforts. Seventh place went to Amanda Baker, who was eliminated from the event after she lost a shown against the eventual winner. Baker moved all in before the flop with A♦ 10♠ and was called by Bicknell, who outkicked Baker with A♥ Q♣. Baker ended up moving ahead after hitting a pair of Tens on the 10♣ 9♦ 2♦ flop, but that lead did not last long after the Q♥ came on the turn, which gave Bicknell a pair of Queens. The 7♥ on the river did not impact the hand and Baker was sent packing. Next to go was Eleanor Gudger, who was knocked out at the hands of Leanne Haas, who won the showdown between the two. With J♣ J♥, Haas moved all in before the flop after a reraise from Gudger, who had A♣ Q♦. Gudger called the all in and was in deep trouble after the flop came 4♣ J♠ 6♦, and found herself needing something huge to happen to stay in the event. It did not happen as the 4♠ on the turn and 5♥ on the river did nothing to help her and she was eliminated in sixth spot. Connie Bruce was eliminated just two hands later as Bicknell claimed another final table scalp. Bruce moved all in before the flop with K♣ J♠ and was called by Bicknell, who showed A♣ 8♥. Bicknell hit an Ace on the flop, which put her further in the lead and she eventually won the hand, sending her out of the event in fifth place. Fourth place in the event went to Shana Matthews after she lost her final hand of the tournament to Haas. Matthews had a solid hand with 10♣ 10♦, but it was not as good as Haas’ K♥ K♣. Matthews went all in on the turn after the board showed 9♦ 4♣ Q♥ 8♠ and was called by Haas. None of Matthews’ outs came on the river, which was the 2♣, and she was knocked out of the event to make way for three-handed play. Julie Monsacre was out in third place after she fell victim to the tournament’s eventual winner. The short stacked Monsacre moved all in before the flop with K♥ 9♠ and was called by Bicknell, who was in front with A♣ 5♠. Bicknell hit a pair of Aces on the A♠ 2♣ 10♠ flop to put her further in front, and the J♣ on the turn along with the 3♠ on the river confirmed her as the winner of the hand. Monsacre’s elimination meant that Bicknell and Haas were the last two players in the tournament, with just 5,000 chips separating the remaining players’ stacks when heads-up play began. Despite the level chip stacks, it took just seven hands of heads-up play for the event to end with Bicknell as its victor. Bicknell took control early on, establishing a solid lead and putting Haas’ stack below 630,000 chips. In the final hand of the event, Bicknell raised to 40,000 before the flop and was called by Haas. The flop came 3♥ 8♣ K♥, after which Bicknell bet 50,000 before being called. Haas reraised to 280,000 on the turn after the J♣ was shown and was called by Bicknell, who originally bet 130,000. Haas went all in on the river after the 7♥ was the final card shown on the board and was called by Bicknell. Haas showed K♦ 9♣, which gave her top pair with a decent kicker. It was not enough though, as Bicknell showed A♣ K♣, which also gave her top pair, but with the top kicker. That meant Haas was eliminated in second place and Bicknell was crowned winner of Event #51.